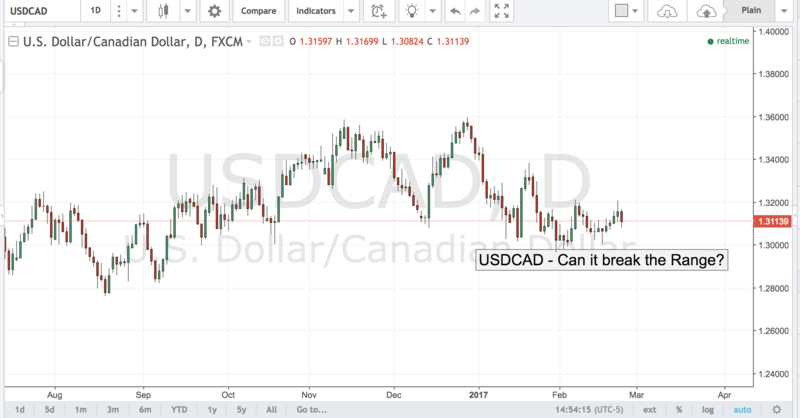 USDCAD – Can it Break The Range? 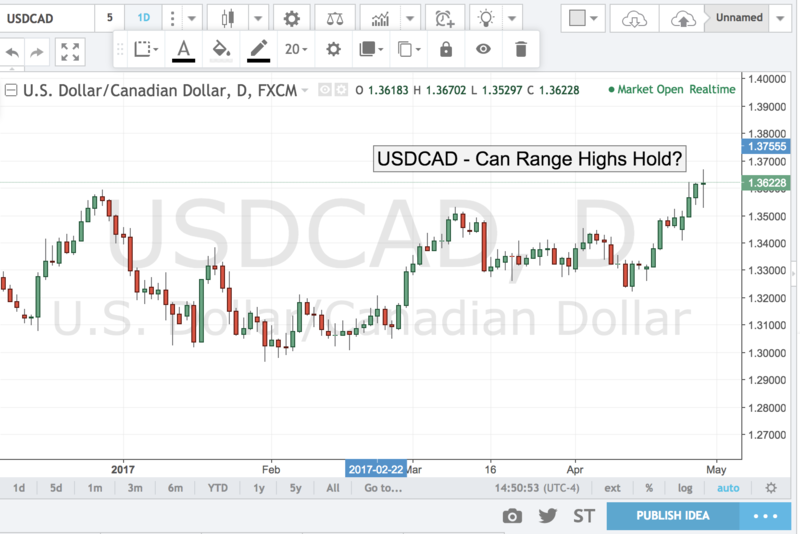 For nearly a month USDCAD has been stuck in a 1.3000 -- 1.3200 range as the vol in the pair compressed despite the fact that oil prices have held steady above the $50/bbl level. 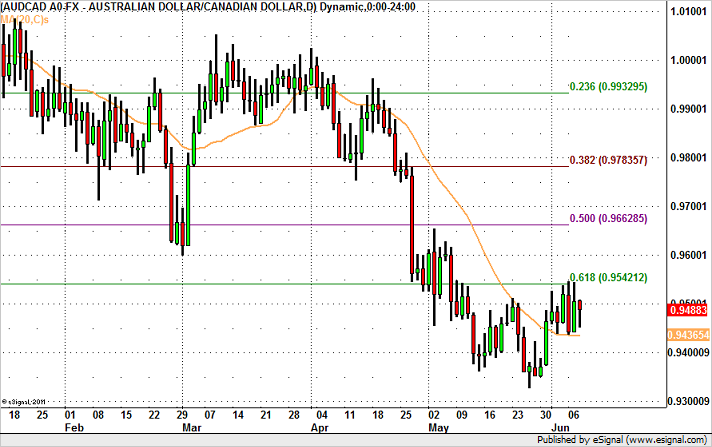 Part of the problem is that Canadian data has been mixed capping any rally in the loonie. This week’s Retail Sales printed significantly worse than expected at -0.3% versus 0.8% eyed. Tomorrow the market will get another key data point as the CPI report will be released. The market is anticipating a rebound after two straight months of negative readings, but given the poor final demand numbers, the prospect of another deflationary month could be quite real. 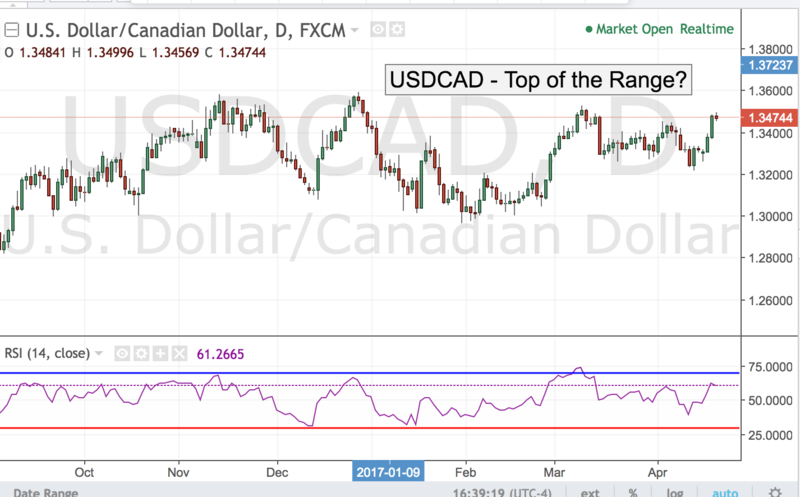 If Canadian inflation is actually contracting that could weigh on the loonie and push USDCAD through key resistance at 1.3200. For now, however, the pair remains highly contained in 200 point range and looks like will remained capped by the 1.3000 -- 1.3200 levels. USD/JPY ended the day in negative territory following the overnight slide in Asian equities and the mixed U.S. non-farm payrolls report. At first glance, job growth in the month of August was horrid with payrolls rising only 173K versus the forecast of 217K. However the details of the report was not nearly as weak with the unemployment rate falling to 5.1% and average hourly earnings rising to 0.3%. As a result, the losses in USD/JPY were limited and a rebound could occur in the coming week with no major U.S. economic reports scheduled for release. Yet the gains ahead of the September 17th FOMC meeting should be limited as Friday’s jobs number failed to revive rate hike expectations. At this stage, it will be very difficult for the Fed to pull the trigger this month. So the trade is to buy USD/JPY on dips between 118 and 119.50 and to take profit between 120 and 121. Technically, USD/JPY broke below the 200-day SMA earlier this week and this decline exposes the currency pair to move below 118. 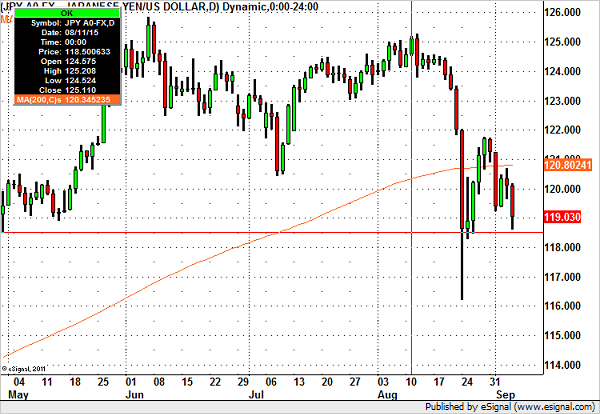 Near term support is at the August 25th low of 118.25 with more significant support at 116.20. Resistance on the other hand is at the 200-day SMA near 120.80. 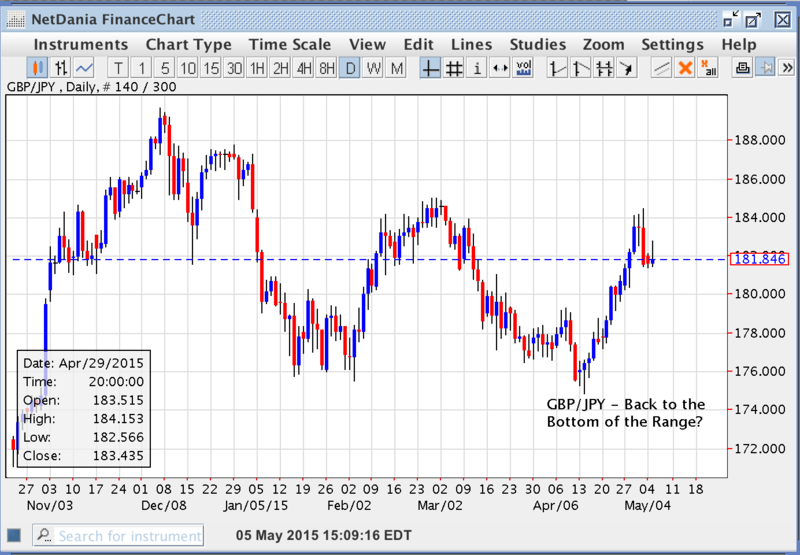 GBP/JPY Back to the Bottom of the Range? With UK election only 2 days away the market appears to be remarkably calm at the prospect of hung Parliament. After countless polls the UK electorate appears to be split into thirds with a third voting for Labor a third for Conservatives and a third for a smattering of other parties. This can lead to a very unstable government that could spook investors especially if the economic situation in UK begins to deteriorate. Technically the pair also looks vulnerable having made a lower triple top as well as a shooting star on the dailies suggesting that sellers are now in control. A break below 180.00 opens the test of the 174.00 level while only a break above the 185.00 relieves the downside pressure. 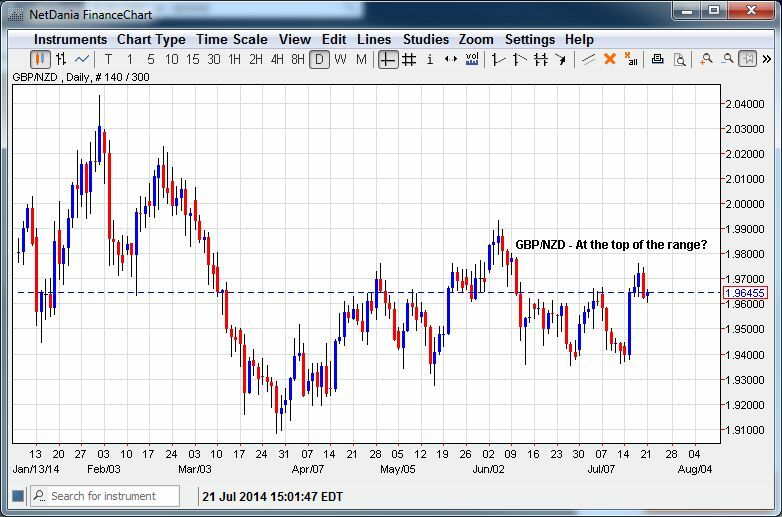 GBP/NZD – At the Top of the Range? This week the focus falls on central banks and no two events are more important than the RBNZ decision and the BoE minutes which are due one after the other. In New Zealand the question is will they or won’t they? Most analysts expect the RBNZ to hike to 3.50% and if they were to do so the kiwi could attract a fresh round of buying especially from yield starved Japanese. However the latest data form New Zealand suggests that the economic growth may be slowing and the Chinese are looking at aggressively diversify from the country’s main export -- milk. That could lay the groundwork for RBNZ to halt its tightening for now which could hit the kiwi hard. Meanwhile in UK all eyes will be on the MPC minutes as traders will look for any sign that there is disagreement about the current state of accommodating monetary policy. If there is a hint that some members would like to tighten before 2014 is over, cable could get another boost in price. In short the GBP/NZD is prime for some volatility as the week proceeds. 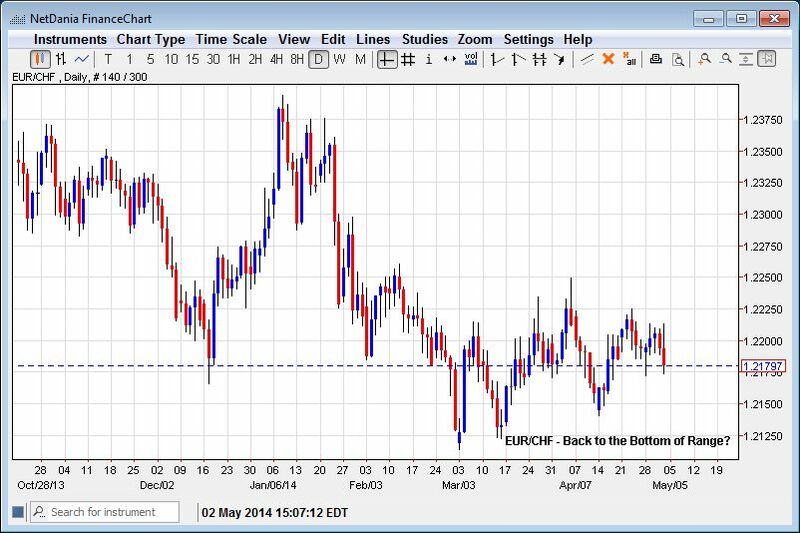 With the European Central Bank meeting tomorrow, EUR is in play. EUR/JPY in particular has been confined within a narrow 200 pip range for the past 3 days between 136 and 138, making the currency pair prime for a breakout. Central bank rate decisions are the perfect catalyst for big moves even if the ECB does not change interest rates. Every month the head of the ECB delivers a press conference where he provides his latest economic and monetary policy outlooks. Mario Draghi’s comments almost always move the euro as traders express their enthusiasm or disappointment with the central bank’s views. EUR/JPY’s reaction to Draghi will depend on whether he acknowledges the recent economic improvements in the economy or ignores them again. Having only strengthened their forward guidance last month, the central bank will be wary of sounding overly optimistic and risk driving rates higher. The odds favor EUR/JPY negative comments from the ECB but most market participants expect the central bank to be dovish so any hint of optimism could send EUR/JPY sharply higher. 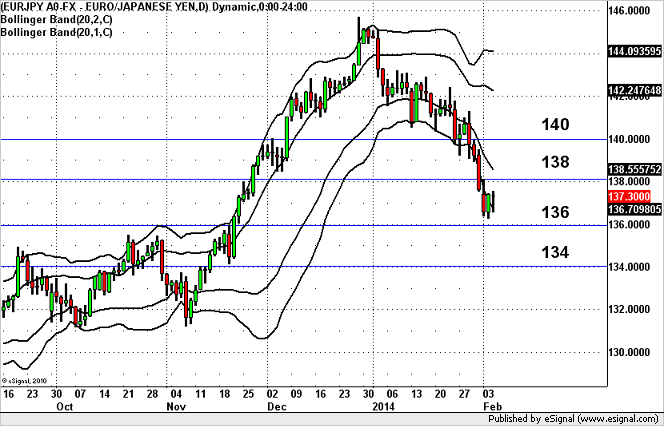 Based on our Double Bollinger Bands, EUR/JPY is deep in sell-zone territory. 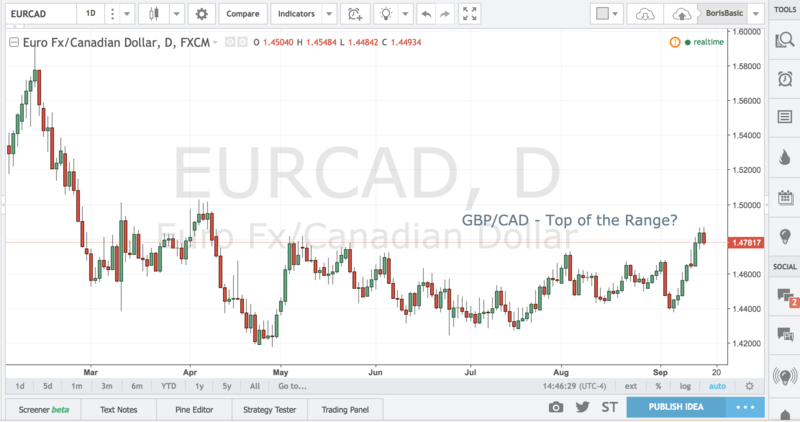 This means that further losses are likely as long as the currency pair holds below the first standard deviation Bollinger Band at 138.55. If this level is broken, EUR/JPY could extend to 140. On the downside, 136 is near term support for the currency and if breaks this level, there is no major support until 134.